Moreover, the beauty of making this dish, I think, is that its’ sauce can be used in many other Korean dishes, such as galbi (갈비), royal tukbokki (gungjung-tuckbokki, 궁중떡볶이) or dduckgalbi (aka Korean meatballs, 떡갈비) to name a few. My specialty is also using this sauce as a base to make my “Mom’s Chichen Galbi.” I always make at least double or triple the amount of what I need that day and store it in a glass jar in the refrigerator for future uses. Mix all the sauce ingredients. If you have a blender, you can puree and mix everything together instead of pureeing the Asian pear and onion separately. Pour the sauce over the meat just enough to coat all the layers and let it sit in the refrigerator at least half an hour. You can always add more sauce later when cooking if needed. Heat a large cast iron skillet or sauté pan on high heat and sautee the marinated meat. Garnish with sesame seeds and you’re done. It’s that simple! Today, I decided to grill the bulgogi directly on the stove fire by using a grilling basket, which is usually used for grilling fish. 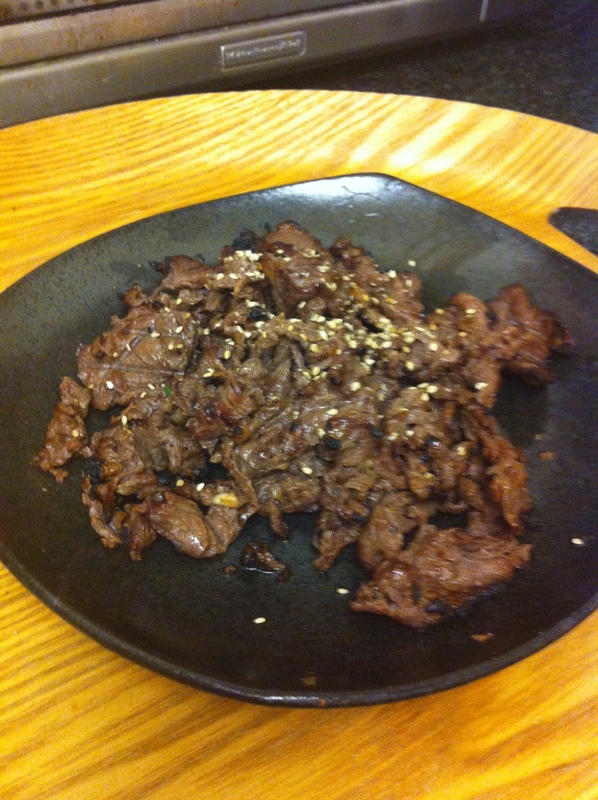 This gave the bulgogi a char and taste that you can only get in restaurants that use charcoal. It was pretty awesome. 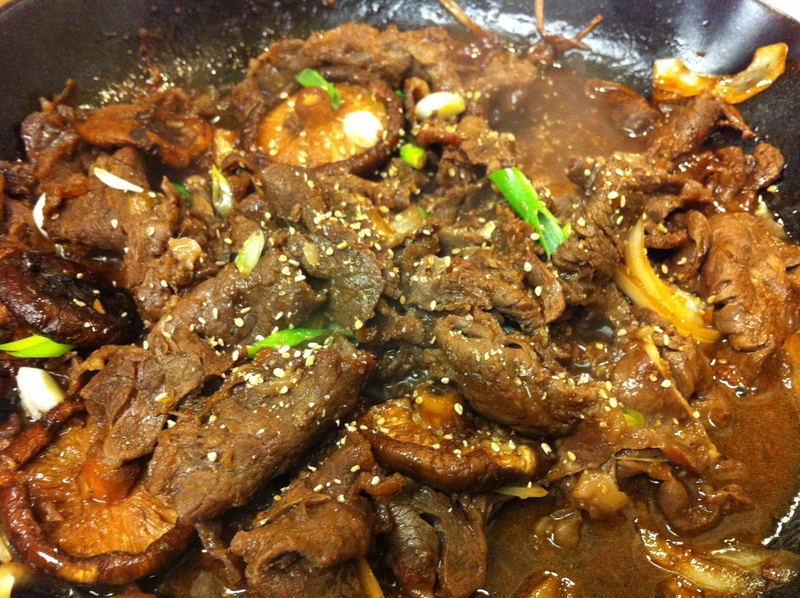 Below is a picture of pan fried bulgogi with sliced onion and whole shitake mushrooms. You can also cut the mushrooms in thin slices. Instead of pureeing the onion, you can also thinly slice it and sauté it with the meat on a skillet. I also like to add mushrooms and julienned carrots when I sauté them. If you like to use vegetables, saute the onions first, add the carrots then add the meat and mushrooms. If you are planning to make more sauce for future use, do not add sesame oil and toasted sesame seeds until you are ready to cook. 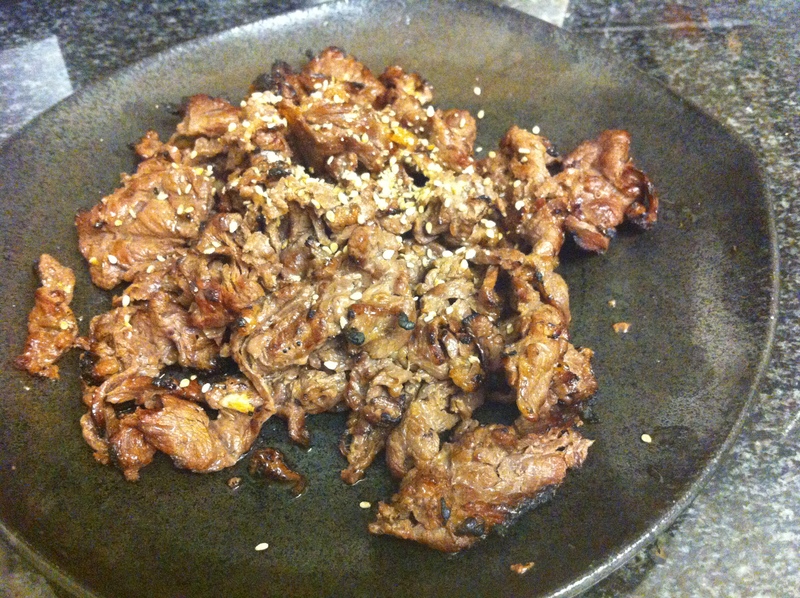 I usually drizzle sesame oil right on the frying pan and cook the marinated meat. Today, I added the sesame oil into the sauce since I was going to grill it straight onto the fire. The Asian pear and Korean apricot syrup is optional. 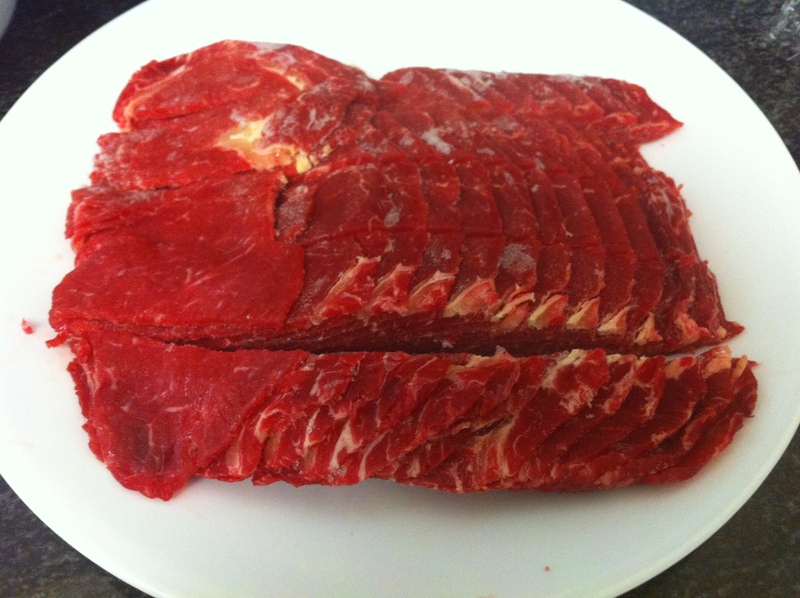 These two ingredients help tenderize the meat and give it a fruity sweetness. If you add both ingredients you might want to add a few more table spoons of soy sauce to balance the sweetness. Asian pears can be found in even American supermarkets these days during the fall and winter, but easily found in Asian supermarkets during these seasons. 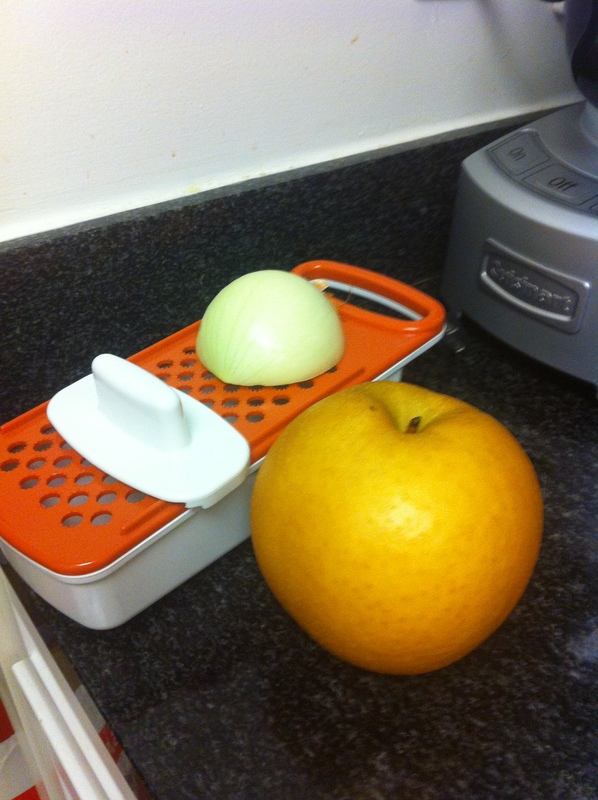 When I buy Asian pears, I puree them and store it in the refrigerator or freezer depending on when I plan to use it. You can replace the Asian pear with pureed kiwi or fresh pineapple juice. You can use a couple splashes of canned Asian pear juice found in Korean supermarkets as well. 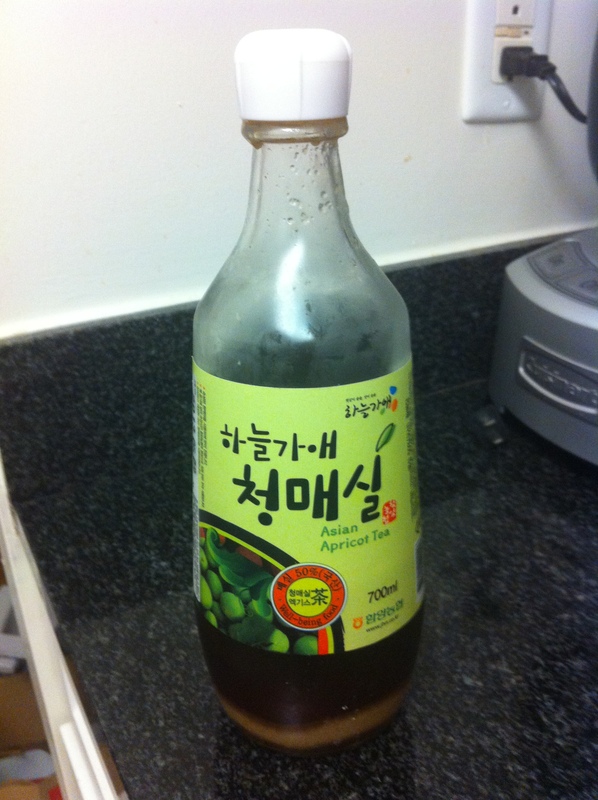 Korean apricot syrup is made only with sugar and Korean apricots. You can easily find this in Korean supermarkets these days. It is sometimes is called Korean apricot tea because you can drink this as a tea simply by adding hot or cold water. Whether added to food or drank as a tea, Korean apricot syrup is known to help the liver function, detoxifying and digestion as well as beneficial to the skin. I personally like it to drink it as a cold tea after a night of too much wine. That recipe is sooo simple! We live in NYC and go to K town all the time but never realized how simple our fav BBQ is. My friend who is Korean told me about your site and how easy it is to make your meals and how delish they are! She lives in Germany now and does not have acess to good Korean food so she makes allot of your dishes. I love them I am greatful she found your site. Can I check with you, Is it of if i use half of pear and half of kiwi for marinate? I tried to use pear before but it did not tenderize the meat.